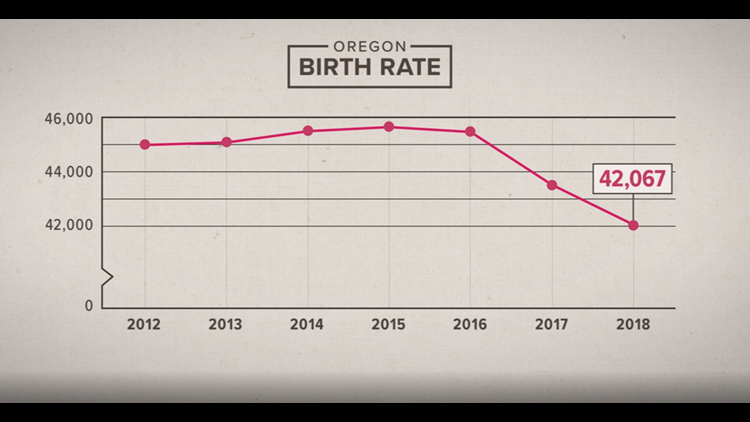 Women in Oregon are waiting to have babies, and the falling birth rates prove it. Last year, the birth rate in Oregon hit its lowest number in twenty-five years at 42,067. This is the second consecutive year that the birth rate has fallen statewide, and the third year that rates have fallen in Washington, Multnomah, and Clackamas counties. This invites the question, what is the cause and repercussions of this? Studies have shown that women are holding off on motherhood compared to prior years. For example, new moms in the early 2000s were between the ages of 20-24, while within the last few years the age of new mothers has increased to be between the ages of 30-34. I found it interesting that it has been found that waiting to have children until their thirties decreases the chance or decision of women to go on to have a second child. While waiting to have children adds to the falling birthrate nationwide and in Oregon, it is not the only contributing factor. A lot of people are in debt due to student loans. Housing prices have been higher, making affordable housing harder to find, and people are becoming more career focused in order to not just pay their bills, but to fund having experiences or a life outside of work. Desiring more free time to pursue travel and other hobbies may not simply aid in the delay of starting a family, but may be a major factor in not wanting to have children at all, which is the case for some women. Regardless, studies are finding that millennials are the slowest generation in American history to begin having children. What does this mean in the long run? Why is the birth rate something we watch? The answer to this is that it directly affects our state’s/nation’s future in areas including, yet not limited to education, housing, taxes, etc. It impacts available resources, supply and demand as well as the job market. Already Oregon is seeing the effects of the declining birth rate in areas that are rural, such as Coos County, whose school enrollment has declined to 2.332 students ( aged 5-17) from what it was in 1990, 2,906 students. How long did you wait before starting a family? If you are a millennial, do you feel the pressure from those outside of your generation to begin having children sooner? How important is having a family to you, compared to other life events?